Simple, yet genius solution to an annoying problem! 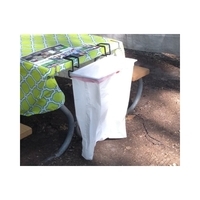 Trash-Ease is a one-piece construction trash bag holder that is perfect for small kitchen spaces, camping trips, cook outs and tail-gating. Easily attaches with no tools or screws, the Trash-Ease uses standard 13 gallon bags. Keep your area mess-free with this easy-to-use, very useful bag holder.